This blog post was made by Dr. Teri Browne on September 25th, 2017. In June, I wrote a blog about how major health care reform could affect YOU. The “Better Care Reconciliation Act” was not successful, but we have a new bill that could have a serious impact on people with kidney disease. The Graham-Cassidy Health Care Plan is the new proposal that would replace the Affordable Care Act (ACA), which some call “Obamacare”. If passed, this new law would also make sweeping changes to health insurance for all Americans. Those with chronic illnesses—like kidney disease—would feel the effects most. Some Senators are still trying to push the bill so quickly that you only have THIS WEEK to make your voice heard (after this week they need to use a different way of voting for health care reform bills). At the end of this post, I’ll tell you how to reach your Senator and what you may want to say. The Graham-Cassidy Health Care Plan would change many health plans that pay for dialysis and the rest of the health care you need. It would not change Medicare, which pays for dialysis or kidney transplants for those who qualify. Medicare never pays 100%, so even if you have it, you still need a second health plan. Medicaid, an employer group health plan, or a private health plan would pay the balance that is left. You can see my previous blog for Home Dialysis Central to learn more about these different plans. HOW WOULD THE GRAHAM-CASSIDY HEALTH CARE PLAN CHANGE MY HEALTH COVERAGE? This bill keeps the ACA rule that children up to 26 years old can get insurance under their parents’ plans. Who would have to buy a health plan? The Graham-Cassidy Health Care Plan does not require all Americans to have a health plan or pay a tax penalty (like the ACA does). But, it does allow your state to require you to have a health plan. Will I have to pay more if I am older? The Graham-Cassidy Health Care Plan allows insurance companies to charge older people more than they charge younger customers. The American Association of Retired Persons (AARP) report that people over 60 years may pay as much as $16,174 more every year to keep their current level of insurance. What would happen to those with pre-existing conditions like kidney disease or being a kidney donor? Like the ACA, the Graham-Cassidy Health Care Plan requires states and companies to offer health plans to all. It says that states “shall maintain access to adequate and affordable health insurance coverage for individuals with pre-existing conditions.” BUT… it does not define what “adequate and affordable” means. Insurance that is affordable and adequate to me is probably totally different than what is affordable and adequate to you. Because the bill says states “shall” and not “must” make sure that people with pre-existing condition have affordable and adequate health insurance, this also allows states wiggle room about what they need to do to make sure that people with pre-existing conditions have good insurance. The plan also allows for states to charge people with pre-existing conditions more for their health insurance. This plan will allow states to create different “risk pools” for insurance companies, and put people who are sick in one “pool” (or group) of insurance, and people who are healthy in another “pool.” The people in the healthy pool will have to pay lots less for their insurance because they have lower medical costs. So your state “shall” have to offer health insurance that pays for kidney disease or if you are a kidney donor, but it may be so expensive you could not afford it and it might not cover what you need. This bill will let states decide how much insurers can charge people who have kidney disease or are kidney donors. The plan also allows states to remove the ten “essential health benefits.” And, it would allow your state to put back lifetime and annual caps on how much your health plan would pay for your essential health benefits. So, companies could NOT pay for drugs, lab tests, dialysis, diabetes supplies, transplant, etc. Or—they could charge you a lot more than you pay now, or only cover a certain amount every year or for your whole life. WHAT IS AN ESSENTIAL HEALTH BENEFIT? What would happen to me if I have a health plan through my employer? A company that operates in more than one state can pick a health plan from any state to use for all employees. Your employer could choose a plan from a state with no essential health benefits. It could choose a plan with annual or lifetime caps—or, all of the above. Even if YOU live in a state that does not approve these changes, you would be stuck. The Graham-Cassidy Health Care Plan also lets large employers not offer health plans. So, you might not be able to get a plan through work at all. What would happen to me if I get my health plan from an Exchange? The Graham-Cassidy Health Care Plan would take away all of the help you may get from the federal government to pay for an Exchange health plan. This plan gets rid of all of the subsidies for Exchange health plans. This plan also gets rid of all of the tax credits for these plans. Your state may create subsidies or tax credits for you to get insurance, but it does not have to- it will be up to every state to decide. What would happen to me if I (or someone I love) is on Medicaid? The Graham-Cassidy Health Care Plan makes a massive change to the way Medicaid is paid for. Under the Affordable Care Act, states could expand Medicaid to cover more people. These states get federal funds based on how much they spend to cover people. All who qualify in these states can get Medicaid. If costs rise (more people need it or there is new, more costly care), states get more money. The Graham-Cassidy Health Care Plan would change this significantly and instead of paying states for Medicaid expansion, they will give states “block grants” - a fixed sum of money that states can do whatever they want with it for health care. States do not have to provide more insurance coverage with this money. This plan would also drastically make changes to the amount of money that some states will get compared to now. States like California, New York, Oregon, Massachusetts, Delaware and Washington DC would have the biggest cuts to the money they now get to help people in Medicaid expansion plans. States will have no choice but to make deep cuts. This may mean that your state will not pay for transportation to dialysis or home health care. New technology, like artificial kidneys and portable wearable dialysis, may be too costly. This plan will let every single state decide what is in their health insurance programs, so every state will be different. The Graham-Cassidy Health Care Plan also says states can ask those on Medicaid to re-apply every 6 months (or even more often). If you or a loved one has ever applied for Medicaid, you know what a paperwork nightmare it can be. Under the Graham-Cassidy Health Care Plan, you might have to do that each month. Imagine how stressful that would be! This plan also ends all funding for these block grants in 2027. That would mean even bigger cuts to services in ten years. Would the Graham-Cassidy Health Care Plan make my health care cheaper? If you have kidney disease, there is nothing in the Graham-Cassidy Health Care Plan that will lower your costs. You may also have other illnesses like diabetes or high blood pressure. You need regular, (and costly) health care. You may need dialysis every week of every year or a transplant. You need to see your doctors (lots of them!). You need to take lots of (costly) prescription drugs. You need lab work. You need surgeries for fistulas and PD catheters. You may be in the hospital. You may need physical therapy. You may need medical transportation. You may need substance use or mental health treatment. You will need to pick a plan that will cover all of your health care needs and treatments. With the Graham-Cassidy Health Care Plan, your health care premiums may dramatically rise to get a plan that will cover all of your needs. What would happen to public health programs that help kidney disease patients? The ACA created the Prevention and Public Health Fund to create programs to improve the health of Americans. This fund pays for things that help those with kidney disease, such as chronic disease self-management, diabetes, and prevention of heart disease, stroke, and infection. The Graham-Cassidy Health Care Plan gets rid of the fund. Will this program give more people health insurance? How much will this program cost? Because the Graham-Cassidy Health Care Plan is moving so quickly, there is no time to get a Congressional Budget Office score for the bill so we do not know how much this program will cost and how many people will get health insurance. The American Medical Association predicts that millions of people will lose their health insurance because of this plan. Other analyses about the financial impact of this plan predict that this plan will reduce funding to states by $215 billion by 2026 and more than $4 trillion over 20 years. Because of all of these issues, NO patient, health professional, health system, insurer or health provider group supports the Graham-Cassidy Health Care Plan. NONE of these groups were involved in writing the Graham-Cassidy Health Care Plan. Because of the fast speed they are trying to pass this bill, there also will be no hearings to hear from such experts about the impact of this bill. In the short time since the Graham-Cassidy Health Care Plan was released, the American Medical Association, American Academy of Pediatrics, American Psychiatric Association, Children’s Hospital Association, American Hospital Association, American Association of Retired Persons (AARP) and many others have come out to strongly oppose this bill. In June 2017, 120 patient groups (including the Polycystic Kidney Disease Foundation) came together to oppose cuts to Medicaid in health care reform like those in the Graham-Cassidy Health Care Plan. The National Health Council speaks for people with chronic diseases and their families and includes the American Kidney Fund and National Kidney Foundation. They oppose the Graham-Cassidy Health Care Plan, stating it “will lead to unaffordable insurance for people with chronic conditions that will be inadequate to meet their health care needs. People with chronic conditions will pay more for less care.” The National Kidney Foundation (NKF) says “this bill allows states to eliminate the essential health benefits currently provided under the Affordable Care Act, and permits insurers to discriminate against people with pre-existing conditions by not covering vital medications and treatments they need to manage their conditions. For kidney patients, this could include treatments such dialysis, transplantation, or medications” The NKF went on to say, “as state Medicaid budgets are tightened across the nation, states may look to reduce the populations they cover and eliminate expensive, but critical, benefits like dialysis treatments.” The Polycystic Kidney Foundation also opposes this bill. Since the start of the ACA, there have been valid concerns about how good a job it does. People may have high deductibles and co-payments. Each year, there are fewer Exchange plans to choose from. There are ways that we could improve the ACA to help you with kidney disease. But, I was a renal social worker before the ACA came out. I worked with patients who could not find any health plan they could afford. I know how impossible it was for someone under 65 to find a Medicare supplement, or a health plan that was affordable at all. Before the ACA, there were no good options for those with kidney disease who needed a health plan but made too much to get Medicaid. Dialysis and kidney transplant patients often reached their annual or lifetime caps on their health plans. Concerned about changes the Graham-Cassidy Health Care Plan would make to your health plan? CALL YOUR SENATORS NOW—or visit their local or Washington DC offices. YOU HAVE TO CONTACT THEM EARLY THIS WEEK- THEY HAVE TO VOTE ON THIS BY SEPTEMBER 30!! Tell them where you live and how you think the bill will impact your kidney disease care. There is no good reason why Congress needs to vote on this bill this week. Ask them to wait to vote on the bill until they have had hearings with patient and health professional experts to figure out the best way to fix our health care system. And to find out how much this plan will cost and how many people will lose their health insurance. Right now, they are making big changes to this bill that will be voted on this week. So there may be changes to the facts of this plan before they vote on it. Senators are also changing their mind about this bill every day. 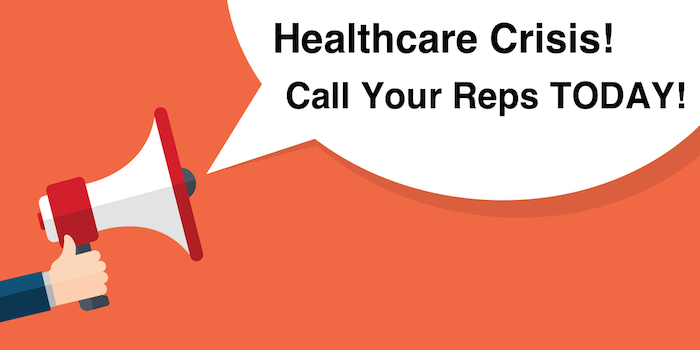 It is still critically important to CALL TODAY to tell YOUR elected official what you think of this bill that would dramatically impact your health. so happy to hear the bill did not pass! Please vote with your hearts and compassion...Picture your family member being newly diagnosed with End Stage Renal Disease and requiring muliple surgeries for access for hemo/pd treatment. And medications needed. Do the right thing for your families and constiuents!!! I am in stage 5 for kidney disease and soon I will need some form of dialysis and other medical help . From what I read on this new bill, I may lose any kidney coverage that I now have. I can afford some of these treatments but not all. So I guess the bill just helps me die a bit sooner. This is heartless when the goverment can spend billions and billions for the pentagon and military spending but we cannot afford to help normal ( not rich people ) with their healthcare. I will bet that congress gets a free ride on all this stuff but the average person living in this ( great ? ) country gets the shaft. I am a previous care partner for my (late) husband's home hemodialysis. I am blessed with excellent health and insurance coverage from Medicare and GEHA so I am not writing on behalf of myself; However, I am still active with the ESRD 'community' and I am concerned on their behalf, as well as my elderly friends and mother. Kidney patients have SO MANY (sneaky) additional health issues and insurance coverage should be the LEAST of their worries! Please put yourselves in their place and imagine how devastating it would be for yourselves, or family members. I am imploring you to 'dig deep' and postpone a vote on this legislation until more of the details are defined and you have had a chance to meet with the people who are directly affected by your decision. please do not let this bill pass!